The VR software industry which was about $129 million in 2015 has grown out to be around $2.57 billion in 2018. In 2014 there were about 200,000 active VR users. It increased to about 90 million users in 2017 and it further increased to about 171 million users in 2018. It is therefore clearly getting ahead in the tech arena. It is therefore clearly getting ahead in the tech arena. Here are some of the trends which we think will propel VR to new heights. Facebook is developing VR features for its social media platform. The Spaces platform offers VR tools that make VR mainstream. The social media giant allows users to share images and 3D objects in an immersive environment where users can see each other and interact as if the other person were real. They achieve this through VR rooms using VR headsets and controllers. Users can share panaromic photos through their smartphones and also 3D environments. This is very informative infographic on various social platforms. Have a look at it. VRChat is the trend toward social VR where users can using tools customize their VR experience like creating full body avatars and hand gestures. Lip syncing and eye tracking makes the interaction seem more natural. The VR market will witness growth from $147 million in 2015 to $41 billion in 2024. VR content is showing up on Youtube where 360° videos can be viewed on tablets, smartphones or desktop. Youtube has a library of 360° developed by both professionals and amateurs. This is a clear indication of the upward trajectory in the growth of VR. 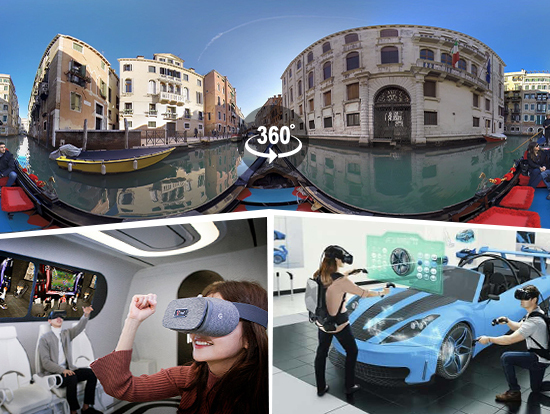 Facebook 360 gives a free platform to share VR content and it ensures that all content is easily accessible through Oculus Rift. VR gaming will be the next big thing on the market now. Valve game company famous for its titles like DOTA 2 and Half life are entering the VR space and are working on three titles in it. This shows that the leading game industries are gearing up to release their titles in VR. There is another company called Neat Corporation which has indicated that Budget Cuts is ready for release and they are very happy about it. Budget Cuts is a single player game which has challenges enough to make it playing worthwhile and is devoid of highly complex elements that often make games boring. This ensures high retention and engagement. Here they Lie is developed by Tangentlemen. They operate under the Santa Monica’s external development group. It lets the users experiences the horror where death is not a checkpoint which was available in PS Plus. VR is also used in movies and films. CityLights acquired Protozoa Pictures’ 3-part VR series called Spheres. The details of the acquisition are not known but it will obviously go like 7 digits. This marked the CityLights intention to enter VR market with a professional content. Live Sports is another big trend in the VR arena. Intel and Turner Sports are giving NBA games through VR. Games like TNT matchups and Marquee NBA were offered through 2018 conference finals. By purchasing NBA League Pass fans could experience games in full VR using Samsung Gear VR, PS VR, Google Daydream View or the Windows Mixed Reality Viewer. NBA on TNT VR gives free access through Daydream view and Gear VR but the user must authenticate through cable subscriber credentials. Many people take vehicle ownership very seriously. For them it means more than just having a transportation medium. It’s about the experience that comes with driving a SUV, truck or a car. VR offers buyers newest models with a whole lot of 3D immersive experience even when the car is not yet present in the showrooms. Lexus started 2018 by partnering with Los Angeles branding agency called Team One to come up with a marketing campaign. VR from Lexus gave a well themed experience of driving the vehicle. While it can’t be near the real test drive, it can really give a good oversight. “Virtual to Reality” is a campaign which enables buyers to have an immersive experience with a host of Lexus vehicles. We have already given the growth projection of VR. They will significantly increase in the coming years. With that the growth of VR developers will be the most obvious implication. VR developers will be much in demand who can develop hard hitting VR apps and games. Healthcare industry was an early adopter of VR when other industries were just second guessing about VR. VR is now recently used for PTSD treatment, medical training and even live surgeries. PTSD occurs when a person is under huge stress like what soldiers face at battlefronts. The affected patients wear VR headsets and are subjected to images which determine the source of their disorder. The idea behind PTSD treatment with VR is that exposing one to stress combined with relaxation skills allows them to effectively cope with it. Dentistry – Trainee dentists practice their skills on 3D models of human teeth or head. They do it without any fear or anxiety of hurting them as they know it is a virtual patient. The trainees can learn about the anatomy of the teeth and mouth in a more immersive way. They are free to make mistakes here, learn from it and rectify it. There is also a haptics enabled drilling tutorial where the trainees learn how to perform drilling virtually. The haptics give the experience of a real drill with the appropriate vibration through a process known as force feedback. Training – This is one of the main areas where the medical field is working hard to excel. In the current medical training, students usually see the surgery being done on a cadaver once or a few times. They are then expected to operate on real patients months after this which naturally gives them jitters. The solution to this is simple. Trainee surgeons and medical professionals are subjected to intense training in VR environment such that the training becomes deep engraved into their subconscious. They do it without causing any harm to patients. There is more information about VR healthcare which is worth going through. VR can act as a solacing factor to injured veterans or physically disabled people in general. They are used in the development of desktop virtual systems which enables persons in wheelchairs navigate in and around the virtual world. They can be made to tackle obstacles and handle themselves in VR environments like a shopping center or busy road and so on. After they have perfected their training they can be exposed to real world. This technology can help the disabled to lead an independent life and aid them to carry out their day to day activities with greater ease. It refers to a kind of VR that is so realistic that one just can’t differentiate it from reality. This is the goal of VR systems as of now. Just like Strong AI is for artificial intelligence field full dive VR is for Virtual Reality. This is a boon to those disabled persons whose limitations prohibit them to enjoy full scale activities in real life. They can turn to VR where there is no pain and inefficiencies of that sort. It might also involve brain computer interface (BCI) where sensory input to the brain will prohibit the input from the five senses. Researchers and developers are working hard to ensure this. 360° video is much like VR. It turns video into an immersive experience and gives us an idea of what the future movies can look like. 360° video records scenes where multiple cameras are hosted on a single device which is a fascinating way to view content. 360° video allows one to pan around and see everything in 360° radius. Viewing VR videos is still in its infancy through Youtube videos. Significant advantage of 360° video is that it can be viewed on smartphones, tablets and desktop computers. One can change the perspective of the video just by changing/scrolling the screen. As per Omnivirt, these videos have received higher engagement than regular content and video. Brands are using them across all verticals. The top names include Microsoft, IBM, NASA, Ford and Henry. The content quality in these industries has significantly increased in recent times. The data was based on the analysis of over 1000+ campaigns in terms of clicks, video completions and overall engagement. There are around 3 million subscribers to YouTube’s channel of 360° videos. The explosive growth of VR is not only certain but is also imminent. As VR devices become more and more affordable VR industry will also grow hand in hand. Some of the trends we’ve highlighted will revolutionize how things are done. Take medical training for example, the fact that trainee medical students can train without harming real patients and in a better way is proof of VR’s potential. We walk in tandem with our clients in providing them apt VR solutions. As we are ever vigilant of these trends we will always succeed in helping them out.